So you’ve just unpacked your Italia Artisan Pizza Oven or Outdoor Oven Accessory, and you’re ready to get cooking. First of all, congratulations on your new purchase. You’re in for plenty of goodies like backyard pizzas (here’s a dough recipe), skillet brownies (we’ve made those too), plank salmon (yummmm), and more. But before you fire up the oven and toss some food onto the stone, we wanted to share a few pro tips with you. These will help you get the most out of your new outdoor oven, no matter what meal you’re cooking. Ready? Here we go. Your stove’s Low and Medium settings will give you all the heat you need for your Outdoor Oven Accessory. Just like a true brick oven or your home oven, preheating your outdoor oven is essential. Always allow 10 minutes or more for your oven to get to the right temperature. Temperatures and cooking times will vary depending on outside temperatures, weather conditions, and what type of food you’re cooking. For example, frozen pizza will cook differently than a pizza made from scratch or store-bought dough. Keep an eye on the internal air temperature by looking at the built-in temperature gauge on the top of the pizza oven. Internal air heat will help melt cheese, soften toppings, and bake the top of your pizza crust. This temperature will react quickly when you change your heat setting or remove the metal oven cover. The pizza stone temperature will rise more slowly than the internal air temperature, but it will eventually become the hottest part of the oven. This is where most of the cooking happens (and how you get a crispy pizza crust). Use an infrared or cooking surface thermometer to monitor your pizza stone’s temperature. The ideal baking temperature for artisan pizza is 500° F to 550° F. Other kinds of pizza are best at 400° F.
To melt cheese or other toppings as you remove your pizza, lift toward the top of the oven and hold for a few seconds before taking it out. Cast iron is perfect for baking breads or desserts in an outdoor oven. 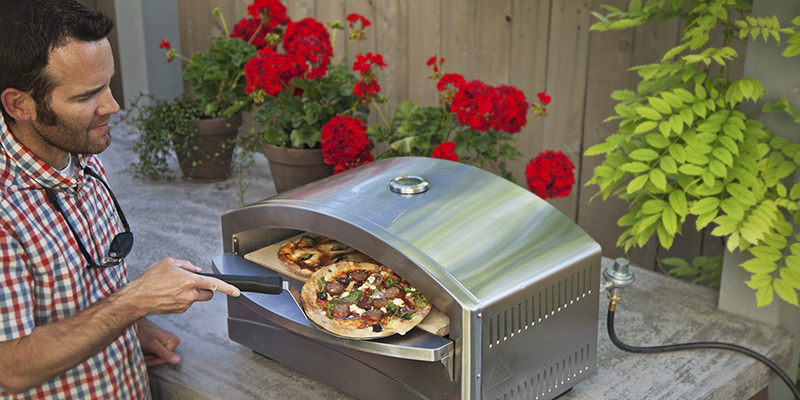 We have a few accessories just for cooking pizza in your new outdoor oven. Check out our pizza peel, pizza spatula, and rocking cutter to complete your pizza chef collection.